how bout a couple real beers? Molsen Golden for me please.............I know right now the Loonie has US beet,,,,,,,,,,,,but think of the postage for all that metal!! My wife and I brew! I've actually got a bunch of friends who brew also. One of them won a local brew competition and he'll have one of his beers in the local brew pub here. Maybe I'll bottle some instead of taking the easy way out (keg) and send some along with whoever gets "IT" from me. I vote for Radam as the new North American Headquarters of the SOHC/4..........Weekly conventions and bench racing meets.........Bring your own sleeping bag! I get the point of this whole thing. I see it says membership not required at the top of the image. Would that create the thought that any make or model bike can ride in this thing or is this rally an SOHC4 Honda thing? i wonder if it should say if you have or are a fan of sohc hondas... Etc? I am a fan of SOHC4's but the SOHC4 I am connected to is my wifes. I own a Yammy. So, it made me think and so thought I should ask. Scrambler, that would work for me. I built a nice big deck on my house that you can sleep on in nice weather. That way you can pretty much just slide out of the hot tub and into a drunken coma. Tipper, I'm not sure what the "rules" are about any of this? I sent the powerpoint I made to one of the other members, but I never got a reply on if he got it. All you have to do is find a pic that you like (I used the one with Godzilla on the bike) and paste it in a powerpoint. After that all you have to do is add text. It's real easy. To me, the image looks great. I do not know the rules either. just wanted to point that out cause it crossed my mind at the time of reading it. My favorite bar tender/owner up here is a Harley guy and I invited him to join the ride, but I'm not sure if he will. 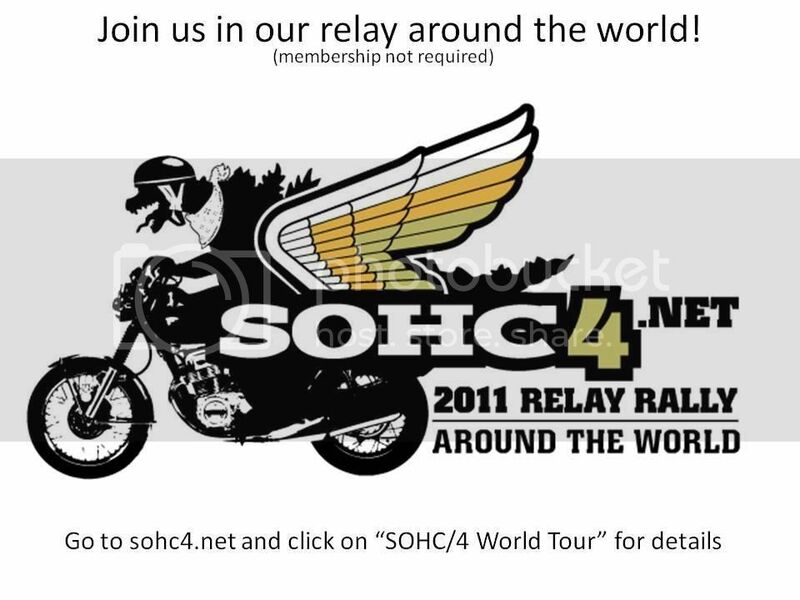 I'm pretty sure anyone can join the ride, but only the sohc4 guys can carry "IT". That's the way I see it anyway. Any progress? A simple printable flyer would be great. Thats the way I understand it to be also. Sounds right to me. Jerry? Wanna weigh in on an "official" set of rules? I'm guessing the hold up on this is what is the appropriate info to have on it. Someone want to just make something up as basis to start talking? Oooohhh, too many rules! Why is the man always trying to bring me down?